The X-Carry goes to Denmark. After four weeks of rigorous testing and evaluation, the decision was unanimous: SIG SAUER P320 X-Carry is the best option, and The Danish Ministry of Defense has now asked SIG SAUER to supply the Danish Armed Forces with the X-Carry. Four (4) pistols – Beretta APX, Glock 17 Gen 5, Canik TP9 SF and the SIG P320 X-Carry – were put in the hands of members from the Danish Special Forces, Military Police, Air Force and Army for a wide range of tests. Testing included (but was not limited to) drop tests, failure to fire, precision and night shooting capabilities in a variety of settings and environments. The possibility to attach a silencer, optics, lasers and/or weapon lights – thereby enabling a custom solution for any soldier – underlined the decision for the P320. The P320 is striker fired, meaning it has no hammer that can get tangled up in gear or elsewhere. The X-series grip and magazine well add speed and flexibility, and the extended beavertail and high undercut trigger guard promote a higher grip and improved recoil control. The Straight X-Series Trigger breaks at 90 degrees, which improves your accuracy by easier handling. 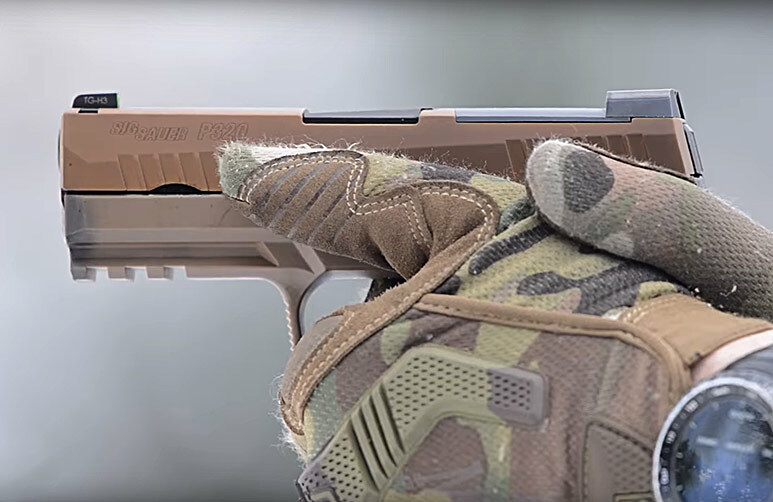 The P320 X-Carry is expected to be delivered to all units by the end of 2019. This entry was posted in News and tagged P320, SigSauer, X-Carry.